Love the top and the cute bag! Lovely photos! Tassel and Pom LOVE to the max!! This is the PERFECT Summer Day outfit and I would wear this all the time and smile big with all the compliments on this bag and outfit! YOU are a DOLL!! Can’t wait to see your dress on Monday! Have the BEST weekend angel!! That’s it, I am raiding your purse collection! You have the cutest bags ever! I feel like I want to make that clutch, also, my cat would love it, great find! You seriously kill me with all of your hand bags and clutches. This one is so adorable! I think my daughter would steal it from me, tho! That top is adorbs, too and it looks comfy for a OTC top! I can see why you get compliments on them! Both such fun pieces (not that I expect any less from you). That clutch is amazing- so over-the-top and fun! Love this casual outfit and outstanding clutch!! Beautiful Shauna!! That clutch. You look so beautiful, and I love your sunnies too! So cute! You have the best clutches girl – this one is so fun! That clutch is a definite statement piece – I can see how it gets so many compliments. This off the shoulder top is so cute, love the ruffle! Gorgeous look! What a cute local find, Shauna! You always have the cutest accessories! Love the off the shoulder number, too. Can’t wait to get more of our Lush shirts in the NSale haha! Have a great weekend! Girl, I’m sure you get compliments with EVERY outfit because you always have the most unique pieces, EVER! I love this look and I’m obsessing over that clutch, which is the cutest! I love the print, my husband is from Guatemala and it reminds me of their textiles 🙂 Thanks so much for sharing, beauty, and I hope you’re having a great week so far! too funny – this phrase comes out my mouth all the time 🙂 I LOVE your clutch! LOVE both the top & clutch, so very you and so very pretty!! Have a great weekend Shauna! That clutch is such a fun piece! I love the color it adds to a neutral summer look. That clutch is actually so cute and original! I love this one and you look so FABULOUS! Love this outfit! The clutch is so cute! What an AWESOME find–that clutch is seriously so much fun! Love how you styled it with the off-shoulder top! I love your top and am obsessed with your clutch! Such a statement piece! I’m in love with the clutch!!! So beautiful!! This is such a fun bag! I love how you styled it! LOVE!! I love how simple and gorgeous the outfit is and that the purse is so fun, nailed it! There is something very goal worthy about that phrase!! I love all of this and yay for elastic tops that stay put!! I love shopping local but not when this purse is involved- we need to get on line and buy it!! Happy weekend gorgeous girl! I’m obsessed with that clutch! This is such a stunning look on you! Girl, I NEED that clutch! I wish it were available online. It is the star of this outfit. Love how you kept everything else simple. Does that clutch have a brand? I love the title of this post! I can definitely see why you get complimented whenever you wear this top or carry that bag. The top is gorgeous on you and the bag is so fun you just can’t help but love it! Omg ! I really need this gorgeous clutch! I love how u wore your top with shorts, bangles, wedges , sunglasses and statement clutch! 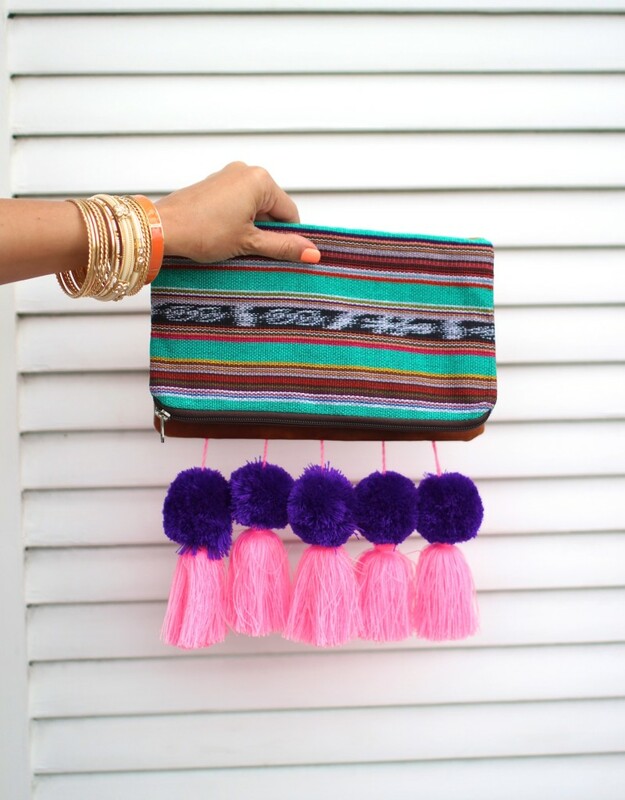 I totally understand why everyone compliments this clutch – it’s so pretty!!! I love it too! You have the best collection of clothes! You have to tell me which boutique, I am so tempted to but it – so fun! Waow! Love your outfit, would like to use one of them for a fashion post on my blog. your picture would be link up to your blog and all the credits. hope you allow me to.